OGP Global Summit 2015 was officially launched on Wednesday, October 28th. Controversy took over the beginning of the day because of "unforced errors" of the Mexican government. 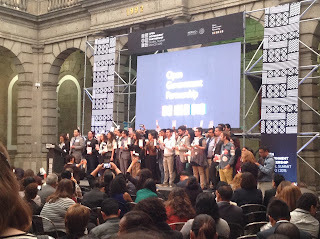 The opening ceremony of the OGP was organized as a closed event for select group of guests, leaving the vast majority of civil society’s members with just the option of watching it, live streaming, in a different building. Beyond this rough start, the Summit provided the space for a large amount of sessions and talks (perhaps the most interesting ones took place in the hallways, as often happens in these events). In this context, I had the pleasure of including a session with 2 of the OGP working group’s co-anchors, Laura Neuman (Carter Center- ATI/FOI working group) and Mark Levene (Government of Canada- Open data working group). This session aimed to consider the intersections between the two communities as well as areas of understandable divergence. It also aimed to explore ideas for mutual support, to build bridges between these two areas. The rationale behind this session relates to the idea that data is an essential component of information. Thus, the possibility of requesting and accessing data in reusable formats (in line with ICT developments) relates to the main goals of both communities. Following this same line of thought, it is clear that- as I mentioned in a previous post- the possibility of requesting and accessing reusable data should be included in any Access to Information legislation. The talk began with speeches by Laura and Mark on the barriers to interaction between actors in the areas of Access to Information and Open Data. The points were intentionally provocative to generate audience’s reaction (and how they succeeded!). Open Data community is very focused on objectives such as innovation and economic growth but ignores accountability. The OGD community is based on data that is proactively published. It doesn’t work on requesting access to politically sensitive data. Different sets of skills are needed to make use of information and data. According to Laura Neuman, intermediaries are necessary to make sense of the data in reusable formats while that’s not the case of access to information legislation (as well as the obtained information). Open data do not make access to information laws redundant. It is clear that these statements were made to triggered reaction and discussion, as many of them are not fully accurate. An example of this is the need for intermediaries to make use of open data and not to request information or to understand the information obtained via ATI/FOI legislation. The difference is not the absence or need for intermediaries, but the knowledge/skills needed in each case. The idea that engagement and dialogue are intrinsic features of the open data, and not so much of the access to information field. Intermediaries, as mentioned above, are necessary in both fields and not only to make use of data in reusable formats. The area of ​​open data allows people to add value to the published data. Data is the raw material that can be used to generate value. Open Data serves for multiple purposes (almost countless, from budget purposes, innovation, transparency, etc.) while the ATI/FOI community usually focus on accountability, almost exclusively. Although some comments were made in jest, they hide some truth. Many of the actors within the ATI/FOI community feel that newcomers, those who work in the area of ​​open data, treat them as "old school”. Moreover, ATI/FOI actors sometimes feel that the open data community focuses more on technological and design aspects than on rights, which they consider most relevant to society. It is clear that these are stereotyped descriptions. In general, you can find a nuance of these typecasts in both groups but here the arguments have been exaggerated to clearly communicate ideas. Even tough panelists and participant couldn’t exactly explain the reasons for the difference, they are clearly related to the so-called philosophical background and, thus, the OGD community’s emphasizes of the hackers ethic, as well as the legal dominances in the ATI/FOI community. After these early interventions that, somehow, built some walls/barriers for interaction, the session started a second instance where the panelists focused on "building bridges" between the two communities. With the idea of ​​reflecting on opportunities for collaboration, the remaining panelists (Melanie, Sarah and Ezequiel) stressed the need for interaction between both fields, to count with tools to take advantage of the information as well as open government data. Along the same lines, it was mentioned that in a time when technology has changed every aspect of our lives, open data have "modernized" and updated, in a way, the area of ​​access to public information to the current times. Due to the limited time and the large number of participants, the meeting was a good first step to raise doubts and questions rather than to think about concrete projects. In spite of that, as I mentioned in a previous post, if it is necessary to keep reflecting on the convergences and divergences between these two communities but it is also time to take action, to think in concrete joint project in which these communities can collaborate with each other. The audience, as well as some panelists, raised a topic worth noting (it also emerged in the discussions at the Workshop on Tuesday 27th). It is the idea that the open data agenda may “hijacked” the ATI/FOI agenda in countries where this type of legislation has not being enacted yet (some sort of leapfrogging). On that same point, some other open data specialists often point out that open data policies at least give the public the option to access to some government data (which it could be translated into "better than nothing"). Both arguments have a point. On the one hand, in cases like the Philippines, as in other cases, ATI/FOI legislation has not yet been fully approved, while on the other side open data policies are being implemented with some success. 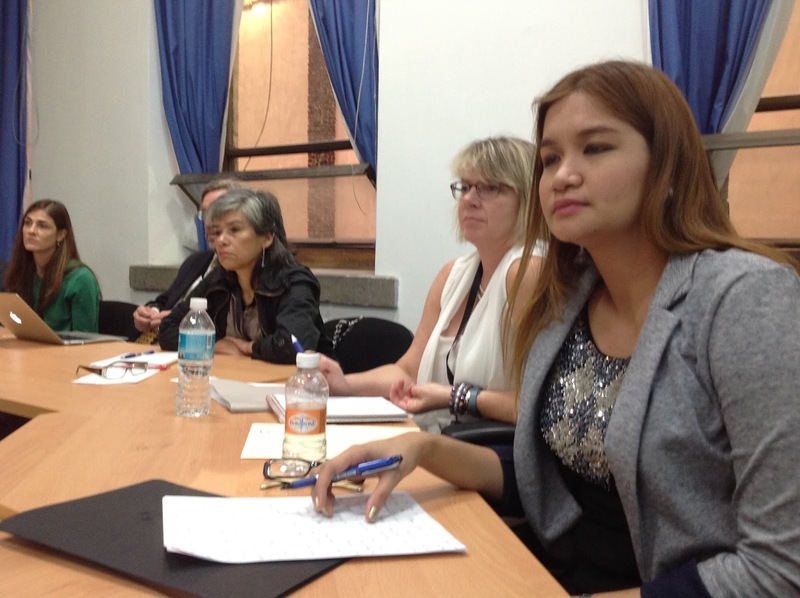 All participants seemed to agree on one point, despite their area of expertise: "record/information management". Both groups seem to understand that you cannot think of access or use/re-use of data and information if that data and/or information is not classified, archived, updated and created in proper formats. This is a point that was raised as an area where both groups should continue exploring and working, perhaps jointly. Another area of ​​mutual interest, which could not be explored during the session due to time’s limitations, is the area of surveillance and privacy risks. Both communities seem to have an overlapping interest in personal data about natural persons (people, not companies or organizations) being properly protected, so that people’s privacy is infringed through the inappropriate release of information or data; and, in some cases, the use of the ‘open data’ banner to provide political cover for this agenda. It is also worth remembering one of the points noted in the workshop day Civil Society: there is a need to work at sectorial level (health, education, etc. ), beyond the generalities of each area. Finally, to wrap up this long post, it is clear that ATI/FOI and open data communities have much in common, as well as some barriers that have to be overcome to achieve a more fluid interaction. This session, as well as the workshop, only aimed to raise the issue and sit the actors in the same room so they can share their views. Now it is time to move these talks and conversations to concrete projects and actions.